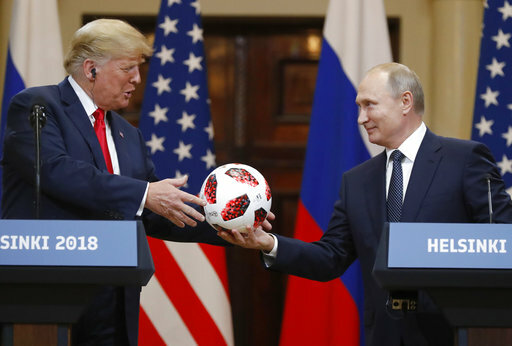 By Katie Akin on Monday, July 16th, 2018 at 6:37 p.m.
President Donald Trump and President Vladimir Putin made inaccurate statements to the media following their one-on-one talks in Helsinki about election meddling, global terrorism and nuclear nonproliferation. Here’s a rundown of our fact-checks. Asked if he believed Putin’s denials of election interference over his own intelligence agencies, Trump brought up "missing" servers of the Democrats, including a server of "the Pakistani gentleman that worked on the DNC." The gentleman in question is likely Imran Awan, who worked in information technology for several Democrats in the House of Representatives. Awan was not affiliated with the DNC. Awan was arrested for bank fraud in July, prompting speculation among conservative groups that he had been involved with election hacking as well. A government investigation found no evidence that Awan was involved in wrongdoing in his IT job, or that he had any ties to election meddling. As for the missing servers, the DNC gave the FBI a full copy of its server when they began working together to investigate the hack. In his June 2017 testimony to the House Intelligence Committee, former FBI director James Comey mentioned that the "best practice" is to inspect the affected machines directly, but that a copy could be used just as well. Putin said that "the Russian state has never interfered… into internal American affairs including election process." Pants on Fire! This statement comes just days after Special Counsel Robert Mueller indicted 12 Russian intelligence officials for meddling in the 2016 U.S. election. And it contradicts the findings of the U.S. intelligence community, members of Trump’s administration and the findings of Republican-led investigations by the U.S. House and Senate. Not only is there a mountain of evidence to show that Russia meddled in the 2016 election, there were also attempts by the Soviet Union to do so from as early as 1960. Putin said that associates of financier Bill Browder "sent a huge amount of money, over $400 million, as a contribution to the campaign of Hillary Clinton." That’s also Pants on Fire. Russians say that Browder and his partners at Ziff Brothers Investments, a New York venture capital firm, illegally syphoned billions of rubles out of the country. Browder also led the charge to pass the 2012 Magnitsky Act, a U.S. law that penalizes Russian officials suspected of sanctioning the death of Browder’s lawyer Sergei Magnitsky in a Russian prison. We checked campaign contribution records and found that associates of Browder — the Ziff brothers — gave $315,000 to the Clinton campaign and the Democratic National Committee. Putin’s estimate does not hold up when stretched to include their donations to the Clinton Foundation and its subsidiaries. When asked if the Russian government had compromising material on Trump, Putin replied that he has heard about the rumors that he had gathered information on Trump during his 2013 visit to Moscow, for the Miss Universe pageant. Putin was firm that he did not know Trump was visiting, and that it would be absurd for him to have collected information on a businessman he did not know. There are also reports that contradict what Putin claimed about the pageant. Rob Gladstone, a business associate of Trump’s, said under oath that Putin had been considering attending the Miss Universe pageant and speaking with Trump, either in a meeting or over a call. The conversation never took place, but a corroborating report said that Putin sent a gift along with a note to Trump. It’s possible that Putin’s spokesman could have been deciding on his own whether Putin should meet with Trump, without telling Putin. See our fact-checks and stories.